We are absolutely sure you are going to love it. Alternote is designed to be the most convenient and natural way to make notes, collect information, write down your ideas, feelings and memories. Does Alternote support iCloud or Dropbox? We’re delivering stable smooth experience to our users. That’s why we don’t want to defocus on support of different platforms. Alternote is created exclusively for Evernote. We do want to bring clutter-free and elegant solution to iPhones and iPads as well. We’re already working on the companion app and planning to release it in 2016. For now Alternote expands some of Markdown entities to rich text. We’re planning to support full Markdown syntax, including code snippets and tables, in version 2.0. What about reminders, work chat and presentation mode? Why my Evernote shortcuts are not available in Alternote? Unfortunately Evernote doesn’t allow developers to access Shortcuts yet, so we implemented own starred notes. 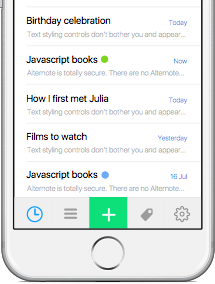 As soon as Evernote grants access to the API, we’ll be the first to support it. Can I use local Evernote notebooks? Your local notebooks are not synced to Evernote cloud service. That’s why third-party applications cannot access them via public interface. Are shared notes and business notebooks supported? Not yet, they will be really soon, in version 1.1. Will Alternote speak my language? Yes, we will work on localisations this Summer. If you’re willing to help, contact us via translate@alternoteapp.com. We’ll be glad to hear from you. Drop us a line at touch@alternoteapp.com. The Beautiful OS X Note-taking App for Evernote. Be the first to know about Alternote for iOS, Alternote 2 for Mac with full Markdown support and other exciting stuff to come.